The process of compounding wealth is best characterized by an interesting paradox: What is very exciting to observe, in retrospect, over long periods of time can appear to be relatively dreary and dull while actually living through the process. The cumulative effect of many years of relentless progress will inevitably result in some staggering figures but many investors have trouble visualizing that eventual result when viewing business or their portfolios on a year-to-year or quarter-to-quarter basis. It is quite common for investors to feel like they need to spot the “next big thing” and to score home runs on a frequent basis in order to compound wealth at an attractive pace but this is not necessarily the case. We have seen multiple boom and bust cycles over the past twenty years that were driven by excitement over both very real and transformative new technologies as well as many transient fads. We have seen massive wealth earned by the shareholders of companies such as Amazon.com, Google, and Facebook. Most value investors, much to their regret, steered clear of these big winners — but also avoided many big losers in the process. One common misconception among investors is that it is somehow necessary to get in on the ground floor of a new industry, company, or concept in order to achieve a satisfactory long term result. 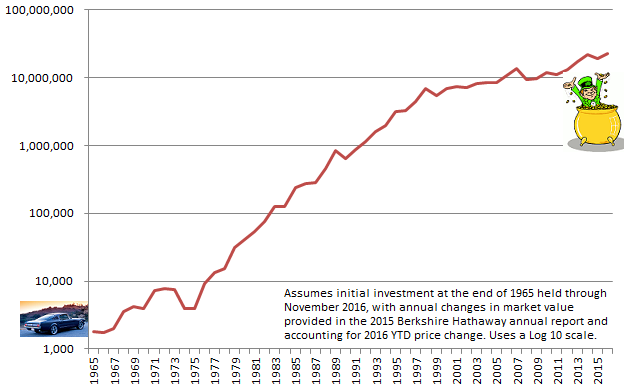 In truth, who wouldn’t have wanted to invest in the Buffett Partnership in the late 1950s? Obviously, that opportunity was limited to people who knew Warren Buffett very well but anyone could have purchased Berkshire Hathaway stock for $18 per share when Mr. Buffett assumed control on May 10, 1965. Let’s say you were in the market for a new car in early 1965 and settled on the Ford Mustang, which had just been released the prior year. The typical MSRP was around $2,400 at the time. But upon learning that Mr. Buffett had assumed control of Berkshire, you instead buy a $600 used 1958 Fairlane and purchase 100 shares of Berkshire for $1,800. Today, those 100 shares would be worth $23.7 million. Other than receiving a dividend of $10 on your 100 shares in 1967, however, you would have seen no cash from the investment over this timeframe. The graph below represents a similar outcome resulting from an investment in Berkshire at the end of 1965 and held through November 2016. Using a log scale allows us to better understand the experience of an investor living through this holding period. This is what achieving compound annual returns in excess of 20 percent over a half century would feel like. But, of course, the example is ludicrous because Mr. Buffett was unknown in 1965 except to a small circle of investors and Berkshire Hathaway was a struggling textile company. And although Berkshire’s stock price gains in the early years were very strong, one would have also lived through a fifty percent haircut during the 1973-74 bear market, even as book value and intrinsic value were going up. Many people would have taken their $4,000 off the table at the very worst possible time. The search for the “next Berkshire” is a near obsession for many value investors. We all want to get in on the ground floor of something great and compound wealth at 20 percent over a half century or more. Who wouldn’t want to do that? However, for the vast majority of us, that dream is pretty much impossible to achieve and there is a risk that costly mistakes might be made in the process of pursuing it. Saying this might be easy from an intellectual standpoint, but we are taunted by the fact that extraordinary gains are, in fact, achieved on a recurring basis and we hear about these results. We do not usually hear about the many cases of failure due to survivorship bias. Perhaps more importantly, however, many of these extraordinary gains are achieved through breakthroughs in technology that would be nearly impossible for most of us to predict accurately in advance. Even if predicted accurately in advance, selecting the right investment vehicles to capitalize on technology is fraught with risk. There’s nothing wrong with aspiring to greatness but, for most of us, it is probably better to be more realistic. If we cannot reliably get in on the ground floor of a skyscraper, is it worth trying to identify companies that are already well on their way to dominance and get in at a higher floor? In the case of Berkshire, those of us in Generation X or later were not even alive during the 1960s and obviously could not have participated in Berkshire’s early years. On a positive note, however, Warren Buffett was already very well known within the investment community by 1990. 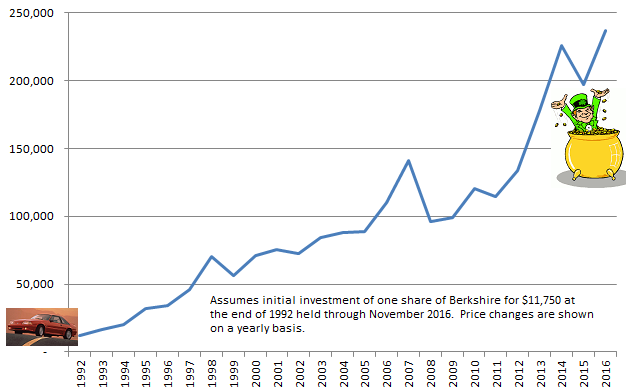 By the early 1990s, Berkshire had a share price in excess of $10,000. Consider a young investor with a net worth of around $15,000 who had spent some time during 1992 studying Berkshire’s track record and was also in the market for a new car. Berkshire’s share price at the end of 1992 was $11,750. That presented a dilemma because Berkshire did not yet have Class B shares and buying even one share would consume over three-quarters of the investor’s net worth as well as make it impossible to buy the new 1993 Ford Mustang which had an MSRP of around $15,000. Our frugal young investor decides to purchase one share of Berkshire and settles for a $3,000 1988 Ford Taurus rather than the new car. The compound annual return in this chart is “only” 13.5 percent, well short of the phenomenal results experienced by someone who invested in Berkshire in 1965. However, our second investor had the advantage of having a much clearer picture of what he was investing in and who was running the show. However, there was nothing “obvious” about making this investment. Warren Buffett was 62 years old. Charlie Munger was 69 years old. Both men could have retired at that point or shortly after and would still have been regarded as having one of the best investing track records in history. It was not “obvious” that they would be running Berkshire nearly a quarter century later. In fact, anyone who confidently predicted that they would be running Berkshire in 2016 would probably have been laughed at. What about valuation? By 1992, wasn’t Berkshire’s track record already so good that the shares would have traded at a completely unreasonable level relative to book value? At the end of 1992, Berkshire’s shareholders’ equity was $8.9 billion and book value per share was $7,745. At a price of $11,750 per share, Berkshire traded at 1.52x book value. Although much more of Berkshire’s intrinsic value was represented by marketable securities carried on Berkshire’s balance sheet at market value, paying a 50 percent premium to book does not seem like it would have been a reckless move at the time. It is easy to look at the chart and a figure like 13.5 percent compound annual returns from 1993 to 2016 but who could have predicted exactly how history would play out? In the early 1990s, Berkshire’s intrinsic value was dominated by its marketable securities portfolio, funded with shareholders’ equity and insurance float, as well as the value of several non-insurance subsidiaries. Over the next several years, Berkshire would be completely transformed by the GEICO and General Re acquisitions. In the 2000s, Berkshire would be further transformed with large non-insurance acquisitions including an electric utility and a railroad. And along the way, investors would have lived through large unexpected underwriting losses at General Re, the September 11 attacks, the 2008-09 financial crisis and countless natural disasters. There is no way that an investor in 1992 could have had the slightest idea of the details of Berkshire’s next quarter century. In many ways, however, we do not need to know the exact details. What we need to know is whether the business model is sound and who is running the show. Berkshire’s history is a story of intelligent and opportunistic allocation of capital. In 1992, there is no way an investor could have know how the next quarter century would play out, but it was possible to know the principles that would guide the company. All that anyone had to do was read Berkshire’s annual reports and Warren Buffett’s letter to shareholders. At some point, massive size does become an anchor. With shareholders’ equity of $269.3 billion and market value of nearly $400 billion, it is nearly certain that Berkshire’s days of compounding wealth over long period of time at 20 percent or even 13.5 percent are long past. Intrinsic value may increase at that kind of rate from time to time but not over a sustained multi-decade period. Investors might be able to buy and sell Berkshire opportunistically to realize returns greater than increases in intrinsic value, but this has its own perils. There is nothing wrong with high single digit to ~10 percent compound growth and Berkshire is likely to achieve this for some time, but many investors will not be satisfied with the pace. We can choose to chase the (nearly) impossible dream of getting in on the ground floor of the “next Berkshire” or we can look at the investment universe as it stands today and try to get in on the 50th floor of a skyscraper that is already under construction. The latter might not offer the chances for thrilling 20+ percent growth over 50 years but is still quite exciting for most of us. Markel Corporation: The Next Berkshire? One of the reasons that 1992 was selected in the example above is because Berkshire’s shareholders’ equity of $8.9 billion was quite similar to the shareholders’ equity of Markel Corporation of $8.5 billion as of September 30, 2016. Obviously these figures are not adjusted for inflation and these are two very different companies. However, the comparison might be instructive. Markel Corporation went public in December 1986 at $8.33 per share which probably seemed richly priced at the time relative to book value per share of $3.42. Over the past 30 years, book value per share has advanced to $609.48 which represents compound annual growth of ~19 percent. The share price has advanced at a compound annual rate of 16.8 percent. Growth has slowed at Markel over the past decade relative to its first twenty years as a public company but has still been respectable with ten year compound annual growth in book value of 12 percent through the end of 2015. We have discussed Markel in the past, most recently in an article regarding Markel Ventures. Markel is still primarily a property/casualty insurance company but almost everything about the way the company has been run over the past three decades seems to be inspired by the Berkshire Hathaway business model. The growth of Markel Ventures, the company’s collection of non-insurance businesses, has been gaining momentum. As with Berkshire Hathaway in 1992, we do not know exactly how Markel’s business will progress over the next 25 years. In fact, management is very unlikely to have a good idea of the specifics either. In 1992, Warren Buffett and Charlie Munger did not know the specifics of how Berkshire would grow over the next quarter century either. The specific details are impossible to know. But the guiding principles that would direct the company’s activities were known at Berkshire and the same appears to be the case at Markel today. A prospective Berkshire Hathaway shareholder in 1992 had no way of knowing the specific actions Warren Buffett and Charlie Munger would take to build value over the next quarter century. The same is true for a prospective Markel shareholder today, or a prospective shareholder of any company. However, what can be known, and likely has predictive value, is how management views capital allocation, the quality of a company’s culture, and the general capabilities of the managers involved. These factors can be known when you get in on the 50th floor of a skyscraper under construction. But they cannot usually be known on the ground floor. In 1965, very few investors would have had any idea about what Warren Buffett was capable of or how a failing textile mill would transform into a massive conglomerate. In 1986, very few investors outside the Richmond business community would have known much about Markel and even fewer could have predicted the subsequent three decades. In 2016, there is no doubt that there are companies one could invest in on the ground floor that will become phenomenal success stories in the decades to come. There is substantial doubt that investors will be able to identify those companies. However, today there are many candidates for investment where the companies are already well under construction and we can get in on a higher floor. Markel is just one possible example. Such investments may not realize 20 percent compound annual returns over 50 years but, for most people, far more modest compound returns are perfectly adequate to meet personal objectives. Disclosure: Individuals associated with The Rational Walk LLC own shares of Berkshire Hathaway and Markel Corporation. Amazon’s New Kindle: Priced as an iPad Accessory?